Cory Martin used matching rounds of 2 under par 70 to cruise to a 5 stroke victory over defending champion Pete Skirpstas in the Professional Division. 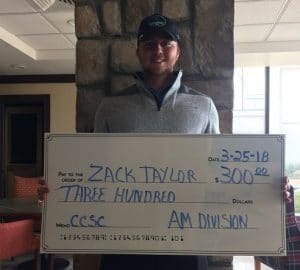 In the Amateur Division, Zack Taylor squeaked out a 1 stroke victory over Nick Schuster to claim the victory. Conditions were tough both days with competitors battling cool temperatures along with wind and rain. Thanks to all competitors who played this week and we hope to see you all again at Cheraw State Park (April 14-15).